During the last decades, the use of air transport has dramatically increased generally due to globalization, which has caused a rising need for mobility. Consequently, aviation-noise exposure has continued to deteriorate mostly for people living in urban areas near airport surroundings. Although many noise-abatement measures have been developed to counter this phenomenon, further actions against noise pollution are needed, as a prolonged exposure to aircraft noise is related to several adverse effects on human health (e.g. cardiovascular diseases, annoyance, sleep disturbance, etc.). Aircraft can be considered as a complex set of noise sources in which, especially during departure, propulsion systems play the main role. In fact, jet engines reach the maximum thrust at take-off, which generally causes the highest noise levels on the ground. Noise generation and propagation during the earliest take-off stages depend on several parameters, which often cause important differences in measured noise levels at the receiver. Apart from the heterogeneity of the aircraft fleet, these fluctuations are also due to the operational settings of each take-off. Due to its vicinity to residential areas, Pisa International Airport has been chosen as the case study to investigate the relationships between the operational characteristics of a large dataset of Boeing 737-800 (the most-used aircraft model at Pisa Airport) flight departures and the noise-associated events. A statistical treatment of the data has been carried out in order to select the parameters most influencing noise-immission levels. Figure 1. 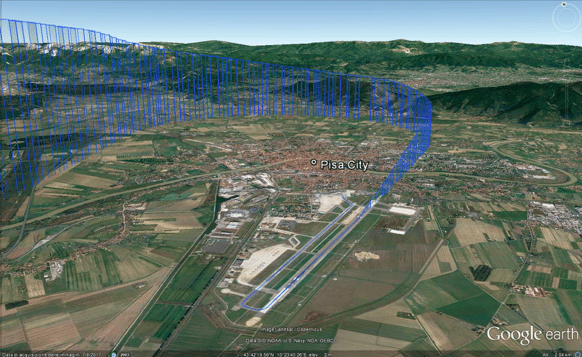 Example of an ADS-B post-processing data of a Boeing 737-800 flight departure from Pisa Airport displayed in Google Earth. Credit: Google Earth / Gaetano Licitra. The operational settings considered in the present work include both source-receiver and take-off ground run distances (TGRDs), lift-off aircraft groundspeed, and groundspeed during the initial climb phase. These flight-departure characteristics have been obtained by means of a specific ADS-B (Automatic Dependent Surveillance-Broadcast, i.e., a flight tracking system alternative/complementary to the most common radar systems) data selection and elaboration (see Figure 1). Actual take-off weight, weather conditions, such as air temperature and density, and headwind have been also taken into account. This research enabled us to develop and validate a simplified model based on the above-mentioned parameters for predicting single-event noise level (SEL) produced by a single aircraft at a given reference point on the ground. The predictive model could be useful to help airport operators on a preventive selection of the noisiest flight events by identifying the parameters associated with the largest noise-level variation. The findings of this work show that actual take-off weight and groundspeed reached by aircraft during the initial climb phase most significantly affect noise level at the receiver (Figure 2a and 2b). In particular, it has been observed that aircraft noise level at the receiver is directly proportional to the take-off weight (see Figure 2a): heavier aircraft must increase engine thrust in order to reach the minimum speed for taking off. This action inevitably leads to an increase in noise emission as engines’ main noise source during departures. In order to contain aircraft-noise impact on the nearest residential areas near airports, airport-specific restrictions on the direction of the departures based on the actual take-off weight of the aircraft may be proposed as an effective noise-mitigation action. It can also be noted that noise at the reference point is directly proportional to the aircraft groundspeed (Figure 2b): giving priority to the groundspeed (i.e. the horizontal component of the aircraft velocity) means reducing vertical speed. As a consequence, the distance source-observer is reduced as well, causing a noisier event at the receiver. Thus, weight for weight, aircraft flyovers generating the lowest noise-immission levels are those reaching the highest altitudes above the observer with the lowest groundspeed. Pilots’ technique adopted during take-off affect these variables; by analyzing the highest and lowest values of TGRDs, which on average correspond to the highest and lowest values of noise levels, respectively, it can be presumed that aircraft covering longer distance on the ground inevitably reaches lower altitudes during the initial climb phase with larger groundspeed both worsening the noise impact. Furthermore, from the experimental data, it has been observed that the heaviest aircraft could, however, cover shorter take-off ground run distances by increasing engine thrust. This would worsen noise emission only during the first few moments of the take-off, in which the aircraft is still inside the airport’s boundary. On the other hand, noise impact would be greatly reduced in the following moments. Currently, longer distances on the ground are probably associated to fuel economy issues. This method could be integrated into an operational guidance enabling stakeholders on the definition of further noise-reduction measures, which should also take into account the relationships among flight-operational conditions and noise-immission levels for a careful planning of air traffic. The projected increase in air traffic volumes enhances the need for quick and efficient solutions to contrast aircraft noise impact. The increasing of the engine thrust during the ground roll phase to reduce take-off ground run distance could be considered as an effective measure against noise that would inevitably lead to a rising in the direct costs related to the fuel consumption increase. However, at the same time, this solution would bring to a decreasing in the indirect costs to bear due to the potential adverse effects on human health. Moreover, the expected increase in the number of flights permitted through the noise reduction achieved by using the suggested noise-reduction measures would result in a balancing of the aforementioned direct costs. These findings are described in the article entitled A statistical evaluation on flight operational characteristics affecting aircraft noise during take-off,” recently published in the journal Applied Acoustics. This work was conducted by Paolo Gagliardi from the University of Siena/CNR-INSEAN, Luca Teti from IPOOL srl, and Gaetano Licitra from ARPAT – Environmental Protection Agency of Tuscany Region. 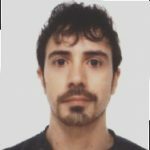 Paolo is a research scientist currently working at the University of Pisa. Luca is a research scientist at IPOOL srl. Professor Licitra's work is focused on environmental physical agents, with particoular attention on noise and non ionizing radiations. Most of his research is addressed to implement models and measurements to assess environmental pollution fin urban areas according with 49/2002/EC directive and to find and experiment new solutions to mitigate noise exposure. Large international collaborations in EU projects (V, VI and VII Framework program, LIfe and Life plus, Interreg etc) and the participation as member of working groups of WHO, EEA, DG Environment, ISO, IEC and concerned actions (ENNAH) permitted him to tdevelop new methods published in international journals and participate to set guidelines that are a reference in the field (WHO Night Noise Guidelines, EEA guide lines on quiet areas, IEC and ISO standards). He is author of a textbook on Noise Mapping published by Taylor and Francis and member of the board of Italian Acoustical Association. He was the chairman of 42th Italian Acoustical Association Congress in Pisa 2014 and collaborated to organize the AIA-DAGA Congress in Meran 2013 and ICSV 22 in Florence 2015. He is from many years Adjunt Professor of Acoustics in Physics Department of University of Pisa and there he was supervisor of more than 50 BSc, Msc, Phd students in the last 18 years.He obtained the National Habilitation of Associated Professor of Applied Physics in 2014. From the birth of Environmental Protection Agency of Tuscany Region, he works for the Agency where is currently the head of Department of Lucca Province and recently Coordinator of Coastal Area.